Bob was CART’s Rookie of the Year in 1981. He finished 9th in points for Fletcher Racing Team …finishing fourth at Watkins Glen and Mexico. Lazier also competed in the 1981 Indianapolis 500 -starting 13th and finishing 19th. after a blown engine caused him to retire….competed in many forms of motorsport in the 1970s including Formula 5000 and the SCCA Pro Super Vee series…In 1972, he placed third in the Formula Bchampionship series, one victory to his credit, and fifth in the Formula Super Vee Championship standings. He also was first in the MiDiv Formula Vee which qualified him for the American Road Race of Champions where he placed second. 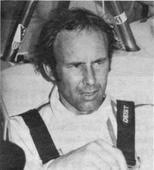 In 1971, competing in Formula B and Formula Vee, Lazier won both divisional titles and the National Formula B crowns.